PRESENT: Ten members attended; apologies were received from nine members. It was a small but select group of members who attended a fascinating meeting on an unusual topic far from the alternative attractions of Wimbledon and Midpex. Before the meeting opened Sami Fereig (ESC 569) made a brief presentation on his forthcoming three-volume A Postal History of Egypt under the Muhammad Ali Dynasty. He announced that the Arabic version would be published in the coming week and the English books in October: and appealed for feedback for a website and new editions. John Davis then opened the meeting with a minute’s silence in memory of our late Chairman, Peter Andrews,noting his short tenure as Life Member.A full appreciation can be read here. The Secretary reported on the sad state of health of Edmund Hall, our Editor/Webmaster, and very much regretted that his illness had forced him to step down completely from both posts with immediate effect. Those attending the meeting expressed their sorrow over this sad development, thanked Edmund for his assiduous work over many years in both roles, and sent him all good wishes. The Secretary will become QC Editor, and Neil Hitchens (ESC651) will take over the role of Webmaster (see panel). A cover franked by the Moss machine with 3 five-millième impressions for New York; and right, another with three ten-millième impressions for Registration. All in magenta, all accepted by US authorities. There then followed a riveting meeting, presented by Paul Green (ESC 128), who denied that he was in any way an expert (though his display indicated the contrary!) on Egypt’s Metered Mail, a topic inspired by the recent discovery of a 4-millieme marking much sought after but unknown since 1922. Paul was the collector perspicacious enough to spot the treasure and snap it up at auction, integrating it, together with other items from his own collection, into a another collector’s group of 150 covers – bought on the spur of the moment - that had languished for some years. Together, the combination provided a feast of unfamiliar material. Not since 1985 had the Circle been regaled with such an extensive display of meter mail – a study report by the late Dennis Clarke in the wake of his original display in April 1979 – and the years between established the development of meter mark collecting, indicated also by the outstanding display of more than 100 pages on our website by Stephen Kaplan (ESC 352). The initial use of meter marking was authorised by the Madrid UPU convention of 1920, setting January 1, 1922, as a starting date. Paul explained that finding meter material up to the 1950s was not easy, but in fact New Zealand had jumped the gun on the UPU by using a locally-produced meter machine from as early as 1904. And it was material from this fixed-value Moss machine, experimentally leased to the National Bank of Egypt in Cairo from February 27, 1922 that opened the display. Paul showed all of the five values, including the prize 4m cover, together with one of three known bearing the 50m value – and settled once and for all a potential controversy. New Zealand had used an ink ribbon variously described as magenta, purple or violet – and Madrid ruled that for international use red ink had to be used on meter marks. The Circle has recorded some “magenta” covers refused and returned, but Paul was able to show covers franked 5+10m and 3x5m for New York, and another with 3x10m for Registration, all accepted by the US authorities without postage due being raised. So “magenta” was clearly in regular use, and other covers must have been returned for another reason. The Moss machine lasted only 145 days before being withdrawn as “unreliable”, having franked covers to the value of £E162. It was replaced only 12 years later by something much more local, a multi-value machine invented by an Egyptian, Chowkah Nessim, which was immediately popular – at least with the philatelic fraternity. The vast majority of covers known are first-day frankings, and usually addressed to well-known philatelists or dealers; normal commercial usage is comparatively difficulty to find. Again that machine failed to last, withdrawn after only five months. 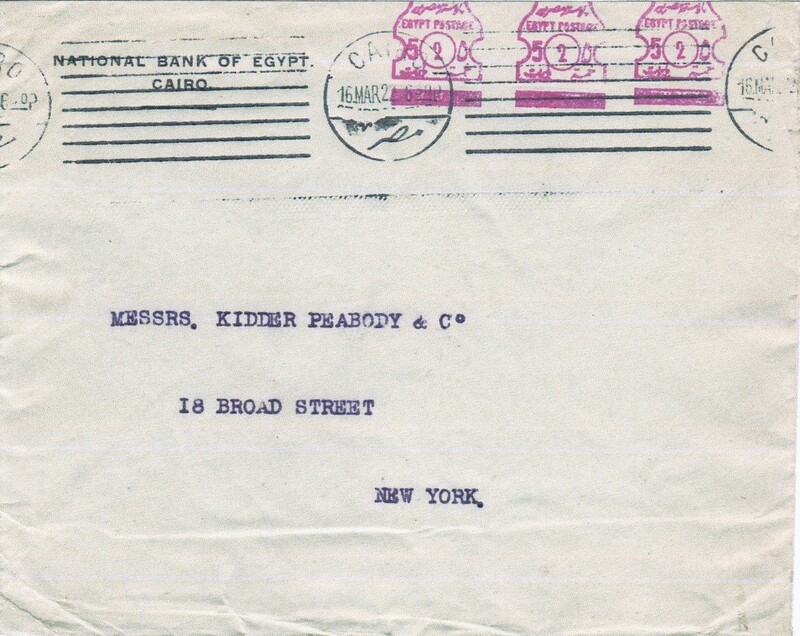 17 Oct 1939: A “Consignee Mail” cover from New York (5c paid), given an additional 5 mills meter franking (Universal Postal Frankers) on arrival in Port Said. 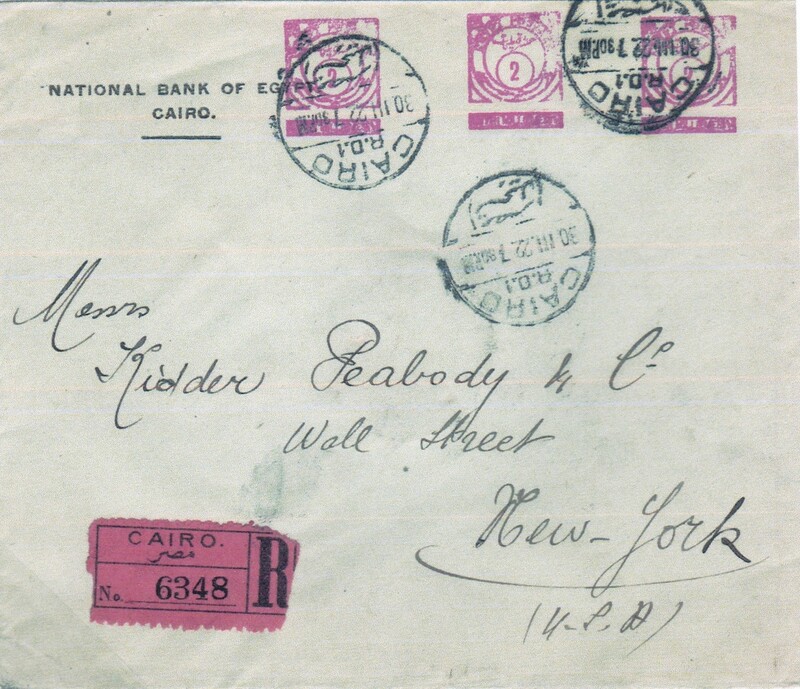 To defray local postage to Cairo? By then the international commercial suppliers of franking machines were aware of Egypt as a potential source of income, and Neopost (Roneo Vickers, British) was first on the scene (slightly before Nessim, in fact), with eight values, followed by Frankotyp (Germany). Universal Postal Frankers (Britain), Hasler (Switzerland), Satas (France), Pitney Bowes (UK), and so on, through a remarkable listing of, according to the International Postage Meter Catalogue (see link on our website), no fewer than 99 different types of marking. Shepheards and the Semiramis both used Pitney Bowes frankers. The designs followed political changes in Egypt, with the early types bearing the crown and the toughra of Kings Fuad in error up to 1938) and Farouk. After the revolution the royal symbols were removed, and between 1958 and 1971 Egypte became UAR or RAU in recognition of the link with Syria. And from 1971 to date the representation is RAE with occasional reversions to Egypt or Egypte. The latest recorded (March 2015) reads Egypt Post. The meter designs, the shape and placing of the town names, the licence numbering, the advertising slogans… this study has only just begun. In variety and range, its comparative low cost and its availability mean that there may be literally millions of covers to examine and research. John Sears, in thanking Paul Green for his “fascinating meeting”, even suggested that it was time for a new catalogue, fully illustrated in colour, to be produced from his collection. He said it was a great pity that so few members were able to enjoy a wonderful display of material “of which we were all aware” but had never taken much notice.” Members showed their appreciation in the usual manner.